A clean and organised house gives us a peaceful mind. Thus, have you think about it that everyone hates to do the job but everyone loves a clean house? Well, we understand that everybody has its own priority, and cleaning is on the last list. Although many of us seem to be really short on the time and we need to find our ways to do our job quickly and effectively. The biggest secret to efficient house cleaning is proper organisation. Yes, once you have an organised rotating schedule in your mind, it becomes a part of your routine. 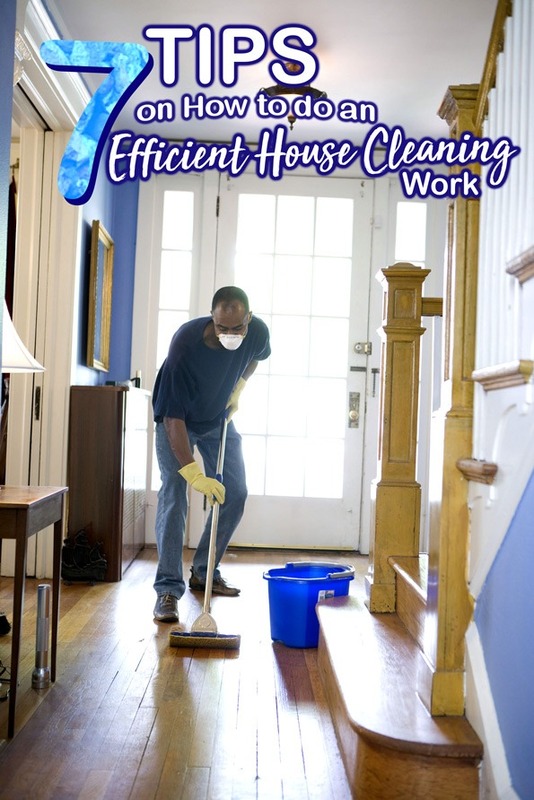 Follow these tips below and see how efficient house cleaning reduce your time as you do your clean-up task. You need to keep in mind that when you clear up the clutters, always start from the top to the bottom, back to front and right to left. When you start your move, make it more precise and accurate to help you not miss an area to clean. And for an efficient house cleaning, try to clear up one area at a time and work your way completely around before you move to another area. House cleaning is a chore and no one really enjoys doing it. What we are enjoying is the result we get after the clean-up. Hence, if you’re distracted as you do the job, the tendency of spending more time to do the task is high. However, you can put some music on and focus on your job at hand. This will give you comfort as you tidy up and you’ll finish the job quickly. Check your cleaning supplies first before you get started. Remember that there is nothing worse than having started your chore and only to find out that you can’t finish your task because of your lack of supplies. So be sure to double check your supplies to make things done properly. Almost all professional cleaners carry their supplies with them as they clean. This helps them do their work fast and efficient. Yes, doing this won’t have to stop you from looking things you will be using. Instead, you’ll work faster knowing that everything you need is right at your fingertips. As you start doing the task, the best part to start is to dust first. Start dusting from top to bottom, so you could vacuum it all the way. We understand that everyone has its own busy life schedule and we don’t have time and energy to allocate to cleaning. However, you need to keep your house clean and safe from any harmful disease caused by bacteria. So, you need to set a schedule and plan your clean-up task whenever you have time. Setting up a plan and schedule will help you prevent burnout because you won’t feel like you need to clear up the whole house at once. As a busy person with so many errands in life, it makes sense to get some help from a professional cleaner. Hence, you should take into consideration the qualities of a good cleaning company before hiring them. Check what services they offer and if they are reliable and trustworthy. A good cleaning company should have the following services; Apartment cleaning, end of lease cleaning, spring cleaning, vacate cleaning, commercial cleaning, and etc. Give some of the above tips a try and you can guarantee an efficient house cleaning work. And if you’re too busy to do all the tips, try to consider hiring a professional cleaner to take good care of your needs. Remember that it is important to keep our abode clean and free from dirt and bacteria which may cause sickness to our family. Be responsible enough for giving your family and yourself a secure and healthy environment. Looking for house cleaning services company? Browse our entire website for more services offered that will surely fit your needs. For we, at Maid in Perth, guarantees to leave your abode clean and sparkling. And if you’re planning to move, read this recommended article House Cleaning Tips and learn what is the thing you need to do before moving to your new place. This entry was posted in House Cleaning and tagged After Party Cleaning Perth, Apartment Cleaning Perth, Carpet Steam Cleaning Perth, Commercial Cleaning Perth, End of Lease Cleaning Perth, Grout Cleaning Perth, Home Cleaning Perth, Maid in Perth, Move In Cleaning, Move Out Cleaning, Spring Cleaning Perth, Vacate Cleaning Perth, Window Cleaning Perth.